Your team was very friendly and professional. We had a wonderful stay at SummerWind! We never had to wait long for an elevator, the condo was spacious and decorated with quality amenities, the pool areas were nice, the led lights looked great at night, and it was a family-friendly environment. We lived in Gulf Breeze when our son was born and moved to Georgia to be near family. We have missed Navarre Beach SO much since the day we moved. It was a wonderful experience to bring our son here and see him play in the ocean for the first time! It was the best vacation ever! They were very nice and helpful. I appreciate all their help. Thank you! We truly did not want to leave and were discussing staying two weeks next year !! Your staff was very friendly and the check-in and check - out was very quick and easy! Your rental office was conveniently located and easy to find. 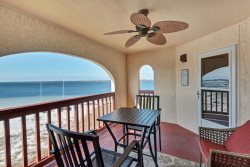 This was our very first visit to Navarre Beach and we loved staying in the penthouse at the Sundunes Condos. It was a marvelous family vacation and the weather was perfect. Your little undiscovered area is wonderful so don't tell too many people about your treasured spot! We hope to visit again in the future. My experience was great. I had a problem with my bank authorizing the fee due to the amount and your team was great working with me to get it straight. I love Navarre Beach and the surrounding area. We needed a large enough property to have a "family" vacation with our children and grandchildren. Luna Sea answered that need for us. We had an area between the townhouse and the dune where the kids could play badminton, throw a ball, or just play in the sand and the adults could sit on the deck and watch. Relaxation and fun was my theme for the week and Luna Sea II provided that. We enjoyed working with the team, everyone was overly friendly and went above and beyond to make sure we had a great stay. Cabana del Sol was the perfect beach house to host our wedding festivities. The bride's immediate family, groom's immediate family and the entire wedding party stayed at the house. It was wonderful to have so much space in the house for all of us to stay together. We had our wedding ceremony on the public beach right down the road, had the cocktail hour in the front yard and the reception in the backyard. We were able to accommodate 80 guests very comfortably at the house and it was a perfect and beautiful setting. The best part about this house was that we could walk down 5 steps straight into the ocean in the backyard! During the wedding reception we had up to 30 people actually dancing in the ocean, including the bride haha! The house was beautiful and very well maintained both inside and out. All of our guests ranted and raved about how much they loved the house and how beautiful the location was. If you are considering having a wedding in Navarre Beach or just looking for a great place to vacation with a large group of people, Cabana del Sol is the place to go! The staff was very friendly and extremely helpful. It has been a pleasure to have the team at one of the condo buildings rather than at a separate office building in the area. That was very convenient. It reminded me more of Turquoise Place on Orange Beach where we visited two years ago. Those kinds of changes make Summerwind even more appealing to us. We had a wonderful experience. The owners were kind enough to purchase an umbrella and two chairs for us--unheard of in past stays--so we could enjoy the beach each day of the week without an extra charge. That was very thoughtful. The condo was lovely, and all that we needed was pretty much at our fingertips. We always stock the pantry and fridge with Winn Dixie--even the manager there was overly beneficent and allowed us to use the store discount without a card. We will definitely continue to return each year for our July visit...and we learned that because we stay each year, we are entitled to a discount if we call directly. The bonuses just continue to accrue. Thanks for making our stay a memorable one! The front desk team was friendly and helpful with every encounter. Check in and check out were a breeze. The whole family enjoyed staying in your condo! It made for the perfect vacation!! Wouldn't stay anywheres else...we really enjoy the resort an everything it has to offer!